Have you ever been hurt by someone? The pain can go deep and feel very heavy. It can be hard to forgive that person who hurt you. Sometimes it feels like you just can’t move on. “I know I need to forgive them, but I don’t know how!” For a while I struggled with this, too. I didn’t even realize at first that I hadn’t forgiven. When I saw the truth about my heart, I wondered what I needed to do to change it. The biggest thing to do is pray. As hard as it may be, pray for the person who hurt you. Pray for God to help you be able to pray for the person who hurt you. Ask Him to change your heart. Come to God honestly and tell Him how you feel, and then ask Him to change you and heal you from your hurt. God is the only one who can change your heart and enable you to forgive. It is as if the words and actions that happened to you are objects that someone threw at you. They hit you and they hurt. Maybe some of them even knocked you to the ground. Once you get back to your feet, you pick all of the hurtful things up and put them into a suitcase. You pick the suitcase up, but the question now is, what do you do with this suitcase you are holding? Sometimes we try to carry the suitcase around with us everywhere we go. We write our offender’s name in big letters on the front, so that everyone knows where our suitcase came from, tie a bow around it, and keep our hurt with us all the time – almost as if it were a little pet. But the longer we carry it, the bigger and heavier it starts to feel. We find that things we used to be able to do are pretty hard now that we have to tote this bulky, heavy suitcase around everywhere. Our arms start burning from fatigue of our burden, and it probably puts us in a bad mood. Another tendency is to try and make the person who hurt us carry the suitcase around. “I didn’t ask for this. It is their fault. They were wrong to hurt me and so they should bear the burden of it.” We try to throw our suitcase at the person who hurt us. We yell at them that this is their fault and they had better pay for it. 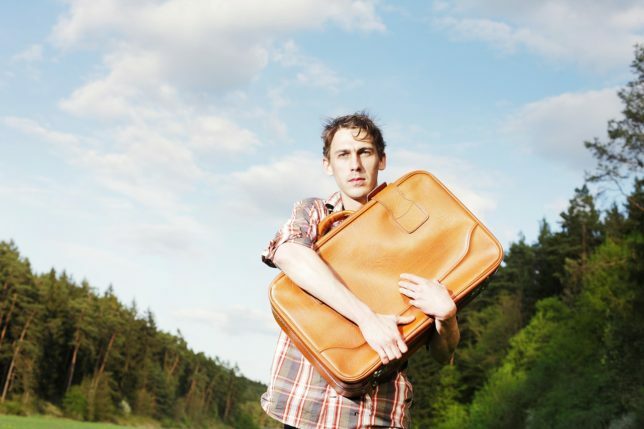 We want so badly to be rid of the suitcase because we hate it, but no one else can carry it. Unfortunately, in our desperate attempts to free ourselves from the weight of our hurt, we may crash into other people around us and hurt them as well. Neither of these situations are what is meant to happen. There is only one right response for us when we find ourselves holding a suitcase full of hurt and wrong that was done to us. As soon as we pick that suitcase up, we are to take it to the throne of Jesus. It is a throne of grace and mercy (Hebrews 4:16), and Jesus will gladly take that suitcase from us and help us to heal from what happened to us. And the good news is that if we find we have been carrying one – or maybe even many suitcases – around for a long time, it is never too late to give it to Jesus! We cannot carry the suitcase ourselves. It only drags us down and hurts us more. We aren’t made to be able to carry it around. And as much as we may try, no one else can take it away from us – only Jesus. But we have to be willing to give it to Him. We have to let go of our claim on what is inside the suitcase. We have to let go of our “right” to our hurt, our anger, our distrust, our constant remembering of what happened, all of it. And every time something from it comes up, lay it down again and again at His feet.